I love sandwiches - probably as much as Joey Tribbiani loves sandwiches. 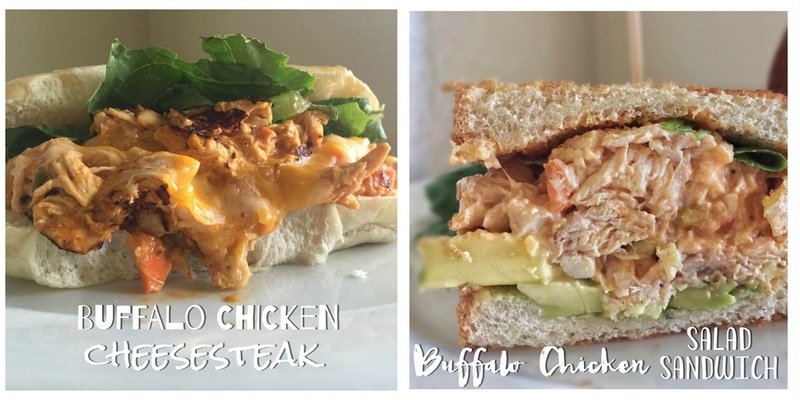 That's why this recipe is well equipped with not one, but TWO ways to use this buffalo chicken to make different sandwiches. You can also use it on top of a salad, on crackers, or by itself, but why waste a beautiful carb-loading opportunity? Use this recipe to make your best chicken cheesesteak, or a cool and creamy chicken salad sandwich - enjoy! 1. Whisk buttermilk, yogurt, buffalo sauce, and Ranch dressing in a large mixing bowl. Fold in chicken, celery, and carrot. Season with spices and toss to mix. 2. Figure out how you want to serve this deliciousness. I tried it both cold, with avocado slices on toast and hot, with melted cheese on a roll. Honestly, it was good both ways, but I preferred the "chicken cheesesteak" over the "chicken salad sandwich". I heated the chicken in a saute pan, placed two slices of cheese on top and covered the pan until the cheese melted. When you leave the chicken in the hot pan to wait for the cheese to melt, it develops a crust on the bottom, which enhances the sandwich so much!